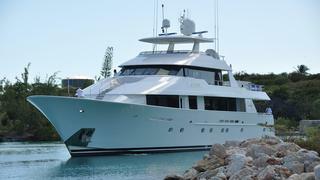 The 39.62 metre tri-deck motor yacht The B&B has been listed for sale by Wes Sanford at Northrop & Johnson. Built in GRP by US yard Westport, The B&B was delivered in 2006 as a Westport 130 model and is fitted with a Naiad at-anchor stabiliser system. This yacht for sale offers a casual yet elegant interior design featuring a classic décor with traditional satin-finished cherry wood panelling and custom designer touches. Marbles, fabric wall coverings and large panoramic windows complement her classic exterior styling and she sleeps 10 guests in five cabins consisting of a main deck master suite with a king sized bed, two VIP suites with king sized beds and twins to port and starboard, all with flatscreen televisions, entertainment systems and en-suite bathroom facilities. Boarding her from the starboard side, guests pass through a marble-floored foyer leading to a formal dining area with seating for ten and then a spacious main saloon with beautiful furnishings. These comprise a settee and ottoman to port with an additional two comfortable chairs. Also, the main saloon has four chairs and a table, perfect for playing cards or having tea or coffee. Moving on up, the sky lounge is a roomy area with lots of light, a bar with two bar stools, an L-shaped settee to starboard and a straight settee to port with an additional chair and ottomans. This is a great area for entertaining or watching movies in comfort. The sundeck, part shaded from the sun by a hardtop, features a large bar with four stools, two built-in seating areas forward with storage beneath, two tables, a fridge, a large barbecue and an extensive sunbathing area with sun pads. She received a complete interior refit in 2017 and is powered by twin 2,735hp MTU engines giving her a cruising speed of 21 knots. Lying in Fort Lauderdale, Florida, The B&B is asking $8,995,000.